I like some jazz music, but have always regretted not appreciating the so called golden era of jazz from the late 50’s – early 60’s. The prevalent pattern of 1) Introduce idea/theme, then 2) Long solos from every member of the group, and 3) Resolution with reprise of theme never grabbed me. I prefer a more melodic approach, and a more band/team oriented approach. No doubt much exists in the music that I do not understand, but there you go. At about the same time I heard this song I read Michael Weinreb’s thoughtful and entertaining defense of college football, A Season of Saturdays. In one section of the book he discusses the fact that “free-spirited” play calling tends to work much more effectively in college than in the pros. You can have a wishbone offense, a spread offense, a pistol offense, and so on. You can have coaches that take a more laid-back approach to the game with great success, i.e. Steve Spurrier, or “gambling” coaches like Les Miles. But . . . these coaches don’t succeed in the NFL. And to win the game, the most old-fashioned of crazy trick plays . . . I realized the possible connection between Miles Davis and these Boise State plays when I had the same reaction as the announcer of the hook and ladder at the .07 mark as I did to “Directions” at about the 6:05 mark. Both moments take you out of yourself entirely. And while certainly pro football can have those moments, I agree with Weinreb (with no empirical backing, just an impression) that they happen more often in college football. Going from 300 or so Division I programs down to 32 NFL teams narrows the field of talent to such a degree that so much depends on meticulous execution over crazy inspiration. Perhaps these kinds of wild, unexpected moments link together jazz and college football, two quintessential American creations. The question I asked myself as I read was whether ultimately I agreed with his premise that college football should stick around and continue to have its place in the American consciousness. Weinreb writes well, and I especially appreciated his soft touch — he doesn’t force his point. But in the end, disagree. College football can exist, sure, but needs scaled back drastically. One caveat is that I fall into a demographic that Weinreb admits will probably not understand his book. I grew up in an area dominated by professional sports, and I attended a Division III liberal arts college where maybe 500 people showed up for football games on Saturdays. Wienreb focuses on his strongest argument, how college sports in particular bring us together in unexpected ways, and this gives college football (more than college basketball, I would agree) a kind of transcendence. I don’t deny this — rather, it’s because I do agree agree with Weinreb on this point that I think we should try and bring college football back to earth. One of the great aspects of music is that it can serve as a vehicle for transcendence, but music appreciation never (or hardly ever) devolves into tribalism. Something always goes a little bit wonky when music gets involved with competitiveness, but college football can’t exist without it. The rivalries can in certain places define one’s whole existence (Auburn-Alabama, Ohio St.-Michigan, etc.). Such tribalism usually has a detrimental impact on us, giving us real animosity based on purely invented and artificial reality — i.e — there is no real reason for students at Notre Dame to hate USC. *** This transcendent tribalism leads to a kind of worship. 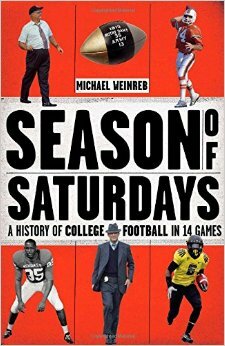 Weinreb attended Penn St., and in one chapter recalls a time when after a dramatic football win on the road, students stormed the stadium, took down a goal post, paraded to Joe Paterno’s house, and deposited it on his front lawn. Weinreb uses this story to support his argument, but I think it supports mine. This presentation of the “sacrifice” on the “altar” looks a lot like worship of a false god to me. So — we have to create an additional unreal world apart from the actual campus community to attract players — some of whom don’t really belong at the university academically anyway — in order to foster this communal experience. The academic scandals involving fake classes, fake grades, and so on should not shock us in the least. After all, in some places college football is a god, and gods need appeased. Plenty of evidence, anecdotal and otherwise, exist to show how athletics tilt and twist universities in weird, unnatural ways. I’m certainly not against sports in general. God made our bodies to do wonderful things. And, as our bodies are a form of revelation, the exuberant moments we experience in athletics are genuine, true pointers to Ultimate Reality. I also don’t blame people desiring such communal transcendence and their willingness to sacrifice for it. Again, we were made for such things. The more we strip everyday life overtly of the sacred, the more we will seek to find it in other, perhaps less obvious ways. But seeking it in college football, as Weinreb admits we do, will in the end not give us answers, but instead, much to answer for. **** We will defend and sacrifice for the tribe to achieve it, making idols of our parochial communities. *Miles Davis must surely rank as one of the great, if not the greatest bandleader of all time. Of course he was a legend, but he helped turn countless sidemen into legends, like Ron Carter, John Coltrane, Tony Williams, Jack DeJohnette, John McLaughlin, Herbie Hancock, Chick Corea, Keith Jarrett — this astounding list goes on and on. **Being beyond structure doesn’t mean that one is anti-structure, anymore than being beyond rationality means being anti-reason. Of course the song has a structure and abides by certain rules of music, but one is not conscious of the pattern — therein lies self-forgetfulness. ***I loved my college experience as have many others, but I think one reason for the appeal of college is its fantasy-like existence. In some ways our K-12 years have many more roots to “reality,” with family, age diverse community, and so on.